Bea Cowan has been Lay Reader at Saint Andrew's, St Andrews since 2008. 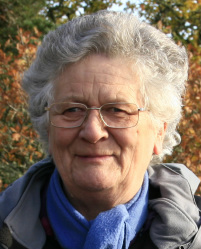 Bea was an undergraduate student in St Andrews in the 1960s, studying Classics, and attending Saint Andrew's Church. After graduation, she taught for a number of years before meeting another alumnus of the University, George, who was by then a physician in the Army. Later (and by now married to George) she accompanied him on a fascinating two year trip to south eastern Nepal in the 1980s. Upon returning to the UK, Bea took up writing and journalism, and was licensed as a Reader in the Church of England in 2002 in the Diocese of Rochester, becoming fully involved in the life of both Parish and Diocese. Drawn back to St Andrews first by a conference in 2003 and then by postgraduate study, Bea and George eventually decided that returning to live in the town was the right thing to do. Bea was relicensed to serve in Saint Andrew's Church in 2008, and delighted by the warmth of the welcome in the congregation she had attended as a student decades earlier.